July has arrived and with it hot, flat beams of sunshine, the smell of sunscreen and the promise of good things to come. With my birthday just a few weeks away, this is a favourite month of mine, forever associated with presents and laughter, long light evenings and time spent with family and friends. Celebration is the order of the day and ice cream is almost always on the agenda. Since getting an ice cream machine for my birthday a couple of years ago, I’ve experimented with a number of different techniques. Each has its own merit but, for my money, the custard based ices always come out on top with their silky smooth texture and rich, rounded flavour. However sometimes life is too short and the weather too hot to spend precious moments at the stove: this is where a one bowl recipe comes in handy. I read a lot of virtuous (read vegetarian, vegan and whole food-focused) blogs – more for their savoury recipes which I enjoy experimenting with than the sweets – but a recipe that kept cropping up (in my reader, on Pinterest, in my dreams) was one involving just three key ingredients of coconut milk, dates and cocoa powder. No heating or stirring or anything complicated needed, just a couple of minutes, a powerful blender and the faith that this would produce a simple, delicious dessert full of flavour and devoid of ice crystals. The result? A ridiculously rich, almost mousse-like ice that is sweet and smooth and chocolaty with just the faintest hint of coconut. It’s not necessarily the delicate recipe I was looking for to counteract the heat outside – if you’re after refreshment I’d go with some sort of sorbet (or a big glass of water) – but it’s definitely something I’ll be adding to my ice cream repertoire. I served small scoops in homemade coconut cones which, in contrast to the ease of making this ice cream are a bit more effort to make. This was my first attempt and the technique is definitely something I want to work on, but in the meantime Carnivorous Fiance and I were pretty happy catching drops of ice cream as they dripped from the ends of each misshapen cone (he even ate one for breakfast). 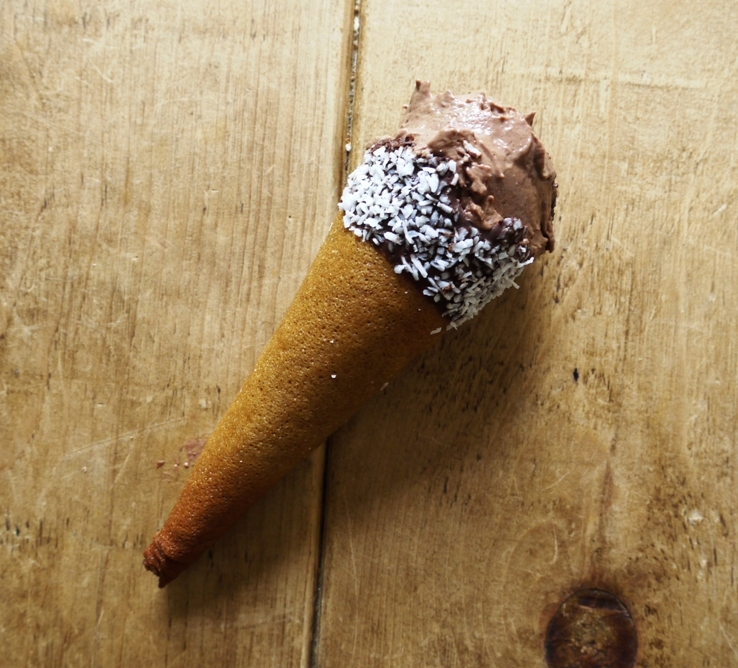 Coconut sugar and spelt flour give the ice cream cones a whole food feel and glorious golden brown colour while dipping the ends in chocolate and then dessicated coconut adds an extra element of flavour and texture. Eaten in conjunction with this velvety ice cream they make for an indulgent, chocolaty dessert worthy of any summer or celebration or birthday. Bring it on. You will need some sort of cone mold to make the cones this recipe but don’t let that put you off – you can pick them up pretty cheap online, or make your own. This ‘how to’ explains it all much better than I could, with some handy photos too. Pour the coconut milk into a blender and add the dates. Leave to soak for 15 minutes then blend until completely smooth. Add the cacao powder, xanthum gum and salt and blend again. You could pass the mixture through a sieve to remove any tiny bits of date, but if your blender is powerful enough you should be fine. Churn the ice cream according to your manufacturer’s instructions. If you didn’t use chilled coconut milk to start with, you will need to chill the mixture in the fridge for a couple of hours first. Transfer into a container and freeze until ready to use. Preheat the oven to 175 degrees C. Line a baking tray with parchment paper, then prepare two additional pieces of parchment paper for later use. In a small bowl, stir together the egg whites, sugar and vanilla. Add the salt, sift in half the flour then stir in the butter until combined. Stir in the remaining sifted flour and beat until you have a smooth batter. Dollop two level tablespoons of batter onto one side of the lined tray and smooth out to a circle approximately 15cm in diameter using a spatula. Repeat with a second circle on the other side of the tray then bake for 10 minutes or until golden brown. Remove the tray from the oven and, working quickly, loosen the first disc, flip it over and wrap around your cone maker, pressing the seal and point firmly to ensure there are no gaps (you don’t want to lose any of your precious ice cream later!). Let the cone cool around the mold then transfer to a tall glass to cool completely and crisp up. Repeat the process with the second disc then bake additional trays of discs until all the batter is used up. Melt your chocolate and coconut oil together in the microwave or in a small heatproof bowl suspended over a pan of water. 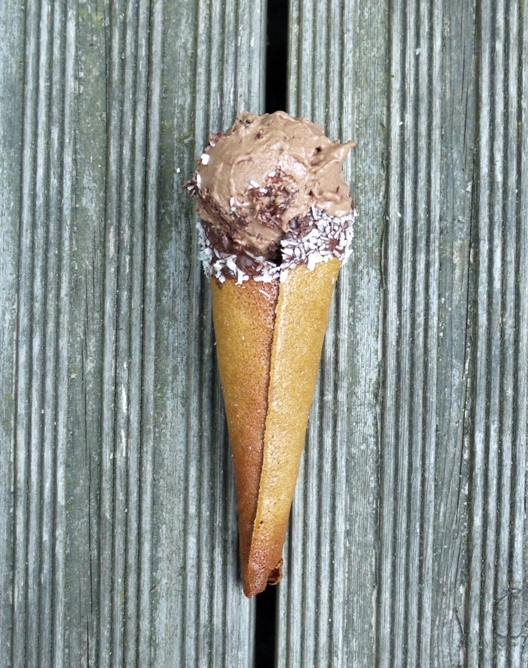 Remove from the heat, allow to cool slightly then dip the end of one ice cream cone in the chocolate. Allow the excess chocolate to drip off then sprinkle with dessicated coconut and repeat with the remaining ice cream cones. To assemble, remove the ice cream from the freezer and allow to soften for 15 – 20 minutes (it sets pretty solid). Scoop one ball into each ice cream cone (this ice cream is rich, you don’t need a lot) and serve. 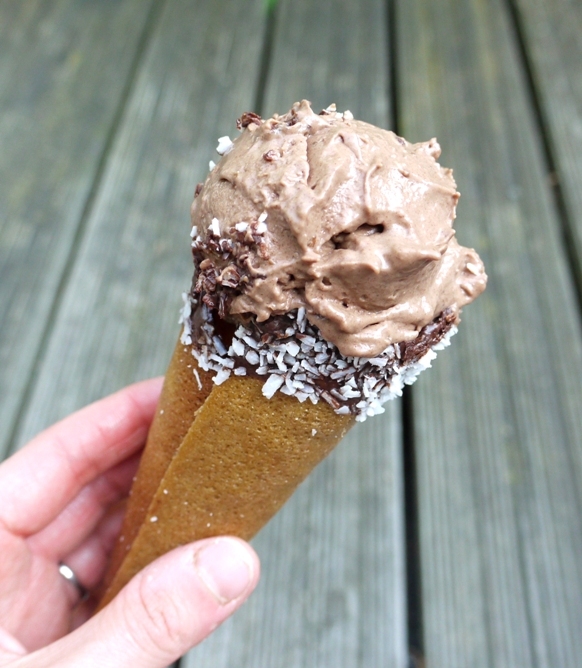 Love that glorious combination of chocolate/coconut/date and totally impressed with your ice cream cones. I think they look perfect! These look perfect for summer. Little bites of heaven, yo. I adore that Perfect Scoop recipe, I’d love to try your version. The ice cream sounds pretty crazy! I love a good quick ice cream recipe! Especially once that looks so smooth and chocolatey. 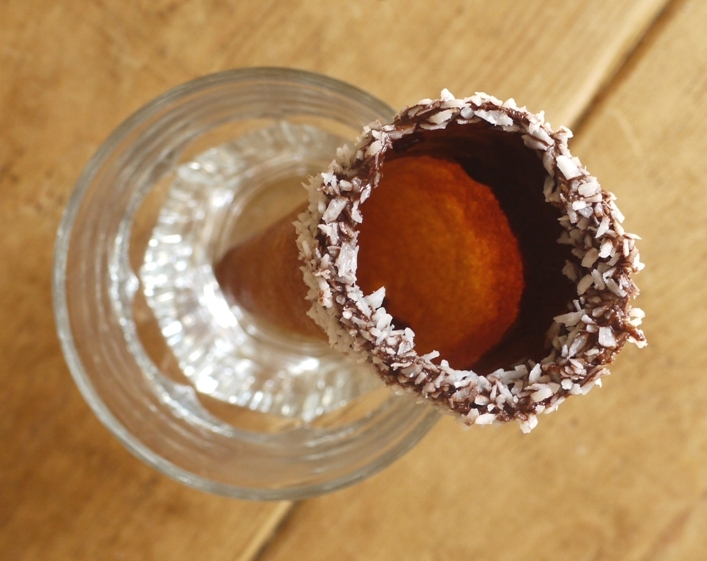 And I’ve never made my own cones before…but I think it is definitely something I need to try! Gorgeous cones… By chance, the heat is FINALLY there in Aix-en-Provence so i may be try your recipe… The pictures are awesome ! It makes the most amazing mousse-like ice cream. In fact if you leave the mixture unchurned in the fridge overnight it goes pretty thick by itself – would make a tasty cream filling for something too. This is just too much – it’s so hot! I must have ice cream. I don’t have an ice cream machine any more… time to invest. I love my ice cream machine…not quite sure what I’d do without it! Wow, you made ice cream cones! I’m ridiculously impressed! Oh my. I could lick the screen. I’ve never tried to make ice cream cones before – they look awesome. It’s an interesting mix of ingredients for the ice cream, I’d love to try it! These look seriously delicious. I have seen the coconut milk method before and it looks super easy. Those cones are beautiful too, why did I never think about making them from scratch before?! Just pulled my ice cream making bowl out of the freezer the other day to make ice cream and love the idea of trying new (and yes quick!) variations. As much as I love the custard-based ones, they take more time and planning than I sometimes have. I’ve seen various coconut milk based ice creams but never got round to trying them so thank you for doing that for me! Will go and crank the ice cream machine up…. Come to mama! This looks fantastic! I eat ice cream all year round – in fact, I reckon the mousselike consistency would be perfect for winter too! This ice cream sounds amazing and yes custard based are my favourite but having one or two quick recipes is also needed and dates, coconut and raw cacao is something I have been interested in since going along to a raw food supper club. I will definitely try this one out, I may need a little more time to try out the cones but I love a challenge! Beautiful! It’s ice cream time around our house now, and we are going to enjoy this. Thanks! This looks fantastic! And such a simple and interesting recipe for the ice cream. I am inspired to make ice cream now! anything with coconut is a winner for me! Love that you made the cones! I could eat ice cream for every meal during the summer especially when it’s homemade! I wouldn’t have thought that a simple combination of those ingredients (ones that I love on their own), could produce such a satin-y looking ice cream. And the cones put it over the top! Thanks Sacha – it’s a really lovely combination. That sounds like an amazing recipe. i love icecream as well and I do have an icecream machine but I should really be using it more often. The custard based icecreams are still a little bit of a mystery for me and I tend to stick to yoghurt based ones instead! If you’ve never made a custard based ice cream I urge you to give them a go – so smooth and rich and delicious! What a fantastic looking cone and I’m so intrigued by the ice cream. I love the idea of just mixing up the ingredients and going. Will definitely give it a go! 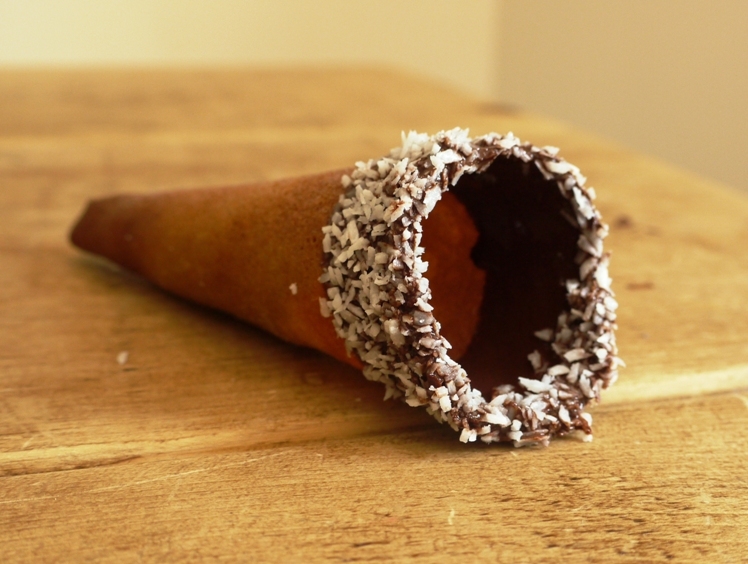 I do love the idea of home made cones, and must have more flavour than just a sugary biscuit in a normal cone. The ice cream idea is a great one. I have a vitamix so may try this out with frozen coconut milk. This ice cream cone looks so delicious! Love how you made the cone from scratch. This is the kind of recipe that blows my mind, especially since I love dates SO much! This is going to the top of my make now list Kate! I’ve got a Rhubarb and Coconut milk ice cream in the freezer and needed a spelt cone recipe and stumbled upon this beautiful post! I was just wondering why you don’t use the yolk of the egg for the cones?